What is English 4 IT? English 4 IT is a self-paced course in technical English for IT students. Think of it as an interactive "online textbook". But it's not dull like a textbook. It's interactive and a lot more fun. The subject matter is suitable for students, professionals, and government career training programs. Topics include: software engineering, tech support, technical sales, and most other IT careers. The focus is on real English as it is spoken in an international job environment. Our content is written by Information Technology professionals and edited by certified EFL instructors. This is not a re-hashed general purpose English course. Students require only B2 (Intermediate) level or higher to succeed in English 4 IT. 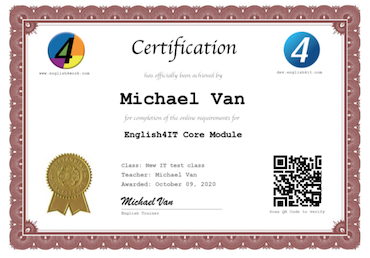 Includes Information Technology English certificate that students can download and print out. A built-in QR code is used to help ID verification. Teachers can customize the certificates with their own school names and classes. Many ESP (English for Specific purposes) teachers don't even know the subject they are teaching. That's okay. Our content is written and narrated by Information Technology professionals, many of whom are certified EFL (English as a Foreign Language) teachers. English 4 IT comes in both Student (self-study) and Teacher (blended-learning) versions. Think of it as an interactive "online textbook" which your students can use to practice pronunciation, reading, grammar, and writing skills. Sign up and get 2 lessons FREE!